یکی از موضوعات مهندسی که از پیچیدگی‌های قابل ملاحظه‌ای برخوردار است کمانش ستونهای واقع بر بستر الاستیک است. 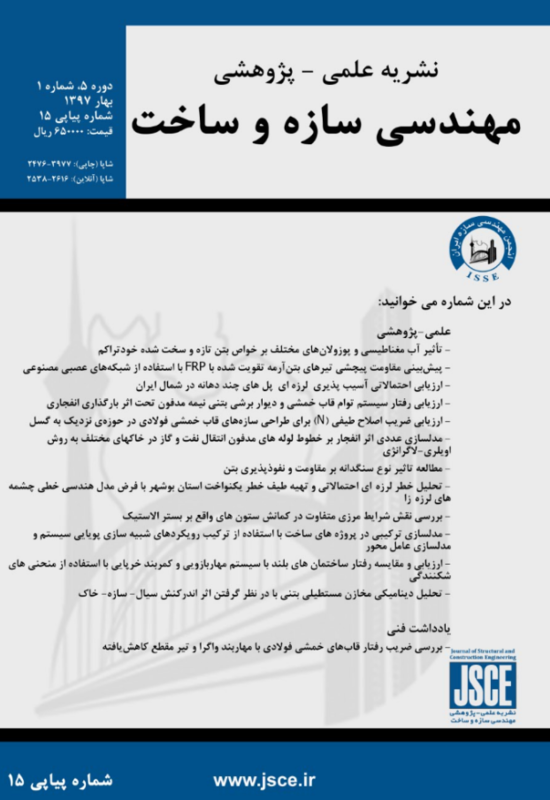 در این تحقیق، موضوع کمانش ستونهای واقع بر بستر الاستیک با شرایط مرزی مختلف به روش انرژی بررسی شده است. لازم به ذکر است که در این مقاله، ستونها بوسیله تعداد زیادی میله‌های صلب دو سر مفصل که بوسیله فنرهای پیچشی به یکدیگر متصل شده بودند، مدل گردیدند و بستر الاستیک نیز بوسیله فنرهایی طولی مدل شد. با تدوین برنامه‌هایی کامپیوتری، برای پنج نوع ستون با شرایط مرزی مختلف، بار بحرانی این نوع ستونها استخراج گردید. ابتدا با در نظر گرفتن سختی صفر برای فنرهای طولی و با داشتن مقادیر تحلیلی بارهای بحرانی ستونها، ضریب سختی فنرهای پیچشی بدست آمد. سپس، با تعریف پارامتری بی‌بعد که بیانگر سختی نسبی بستر الاستیک نسبت به سختی خمشی ستون بود، بار بحرانی برای پنج نوع ستون برای محدوده وسیعی از سختی نسبی بستر الاستیک بدست آورده شد و نتایج کار به صورت نمودارهایی ارائه گردید. با توجه به اینکه برای ستون دو سر مفصل متکی بر بستر الاستیک حل تحلیلی وجود دارد، در این مرحله، صحت-سنجی کار برای این نوع ستون انجام شد و تطابق بسیار خوبی بین بار کمانشی بدست آمده از حل تحلیلی و بار کمانشی بدست آمده از مدل اجزاء محدود برای سختی‌های نسبی مختلف بستر مشاهده شد. با استفاده از روش برازش منحنی، برای چهار نوع ستون دیگر، روابطی ریاضی پیشنهاد شد که با استفاده از این روابط ریاضی، بار بحرانی ستونهای مذکور با دقت قابل قبول مهندسی بر حسب سختی نسبی بستر الاستیک محاسبه می‌شود. In This research, the subject of buckling of columns on elastic foundation with different boundary conditions by energy approach has been presented. Columns modeled by two-end rigid bars where interconnected to each other by rotational springs, and elastic foundation modeled by translational springs. By preparing computer programs for five column types with different boundary conditions, the critical loads of these columns have been obtained. This five types of columns include two hinge end column, one fix end-one hinge end column, two fix end column, one fix end-one free end column and one hinge end-one free end column which are located on elastic foundation. At first, the stiffness of translational springs is set equal zero, and by knowing the analytical solutions, the stiffness coefficients of rotational springs have been gathered. Then, by defining a dimensionless parameter which showing the relative stiffness of elastic foundation, the critical load for a wide range of foundation stiffness has been obtained and results are presented in form of some graphs. There is analytical solution for two hinge end column on elastic foundation, therefore, at this stage, verification has been done for this kind of column and a very good consistency is observed between analytical buckling load and finite element buckling load for different relative stiffness of foundation. In fact, there is a linear relation between buckling load of two hinge end column and relative stiffness coefficient of foundation. But, for other four type columns, this relation may not be linear. Therefore, by means of fitting curve method, for other four type columns, some mathematical relations are proposed, which by these mathematical relations, the buckling load of above mentioned columns are computed in according to relative stiffness of foundation by acceptable errors. Chen ,W. F, Lui, E. M. )1987(. Structural Stability: Theory and Implementation”, Englewood New Jersey, PTR Prentice Hall, pp.2 &426. Hetenyi, M., Beams on elastic Foundation. 8th printing, Ann Arbor. Timoshenko, S. P., Gere, J. M., )1961(. Theory of elastic stability. 2nd. Ed.New York, N.Y., McGraw-Hill, pp. 100-107. West, H. H., Mafi, M. )1984(. Eigenvalues for columns on elastic supports. J. Struct. Engrg, ASCE, Vol. 110, No. 6, pp. 1305-1320. Razaqpur, D. G. (1986(, Stiffness of beam-columns on elastic foundation with exact shape functions. Computers & Structures, Vol. 24, No.5, pp. 813-819. Cheng, F. Y., Pantelides, C. P.,)1988(, Static Timoshenko Beam-Columns on Elastic Media. J. Struct. Engrg. ASCE, Vol. 114, No. 5, pp.1152-1172. Wang, C-M., Xiang, Y., Kitipornchai, S., (1991). Buckling of restrained columns with shear deformation and axial shortening. J. of Engrg. Mech.ASCE,Vol.117,No. 9, pp.)1973(-)1989(. Struthers, A., Jayaraman, G. )2010(. Elastic stability of columns on partial elastic foundations under subtangential loading. J. of Sound and Vibration, Vol. 329, No. 18, pp. 3856-3865. Morfidis, K. ( 2010(. Vibration of Timoshenko beams on three-parameter elastic foundation. Computers & Structures, Vol. 88, No. 5-6, pp. 294-308. Avramidis, I. E., Morfidis, K. ) 2006(. Bending of beams on three-parameter elastic foundation. Int. J. Solids Struct., Vol. 43, pp. 357-375. Onu, G. ) 2008(.Finite Elements on Generalized Elastic Foundation in Timoshenko Beam Theory. J. of Engineering Mechanics-ASCE, Vol.134, No.9, pp.763-776. Aristizabal-Ochoa, J. D., K. )1994(. Factor for Columns in any Type of Construction: Nonparadoxical Approach. J. Struct. Engrg. ASCE, Vol.120,No.4, pp.1272-1290. Areiza-Hurtado, M., Vega-Posada, C., Aristizabal-Ochoa, J. D., Second-)2005(. Order Stiffness Matrix and Loading Vector of a Beam Column with Semirigid Connections on an Elastic Foun-dation..,J. Engrg. Mech., ASCE, Vol. 131,No.7, pp.752-762. Arboleda-Monsalve, L. G., Zapata-Medina, D. G. and AristizabalOchoa,J. D.,Timoshenko. )2008(. beam-column with generalized end conditions on elastic foundation: Dynamic-stiffness matrix and load vector., Journal of Sound and Vibration, Vol. 310, pp.1057-1079. Zapata-Medina, D. G. Arboleda-Monsalve, L. G. AristizabalOchoa, J. D. )2010(. Static Stability Formulas of a Weakened Timoshenko Column: Effects of Shear Deformations. J. of Engineering Mechanics-ASCE, Vol. 126, No. 12,pp.1-9. Aristizabal-Ochoa,J. D. )2013). Stability of slender columns on an elastic foundation with generalised end conditions. Ingeniera e Investigacion, Vol. 33, No. 3, pp. 34 - 40.